Edraw includes several arrangement tools to help you lay out workflow shapes neatly and evenly. You might use different tools at different times while you create workflow diagram. Some can make small adjustments to shape positions, and some help you rearrange the entire diagrams. A workflow diagram breaks down the team member's functions during each stage of the project, allowing managers to see who is working on what aspect of the project at any given time. The benefit of having this diagram drafted ahead of time is that managers can assess which departments might need to be allocated more human resources to produce the project on time. For instance, when looking the order flowchart below, managers might discover that to improve user experience, we need to add members to our support team and find more means to help users. Planning for errors should happen at every stage of the project, and a workflow diagram can help illustrate any contingency plans. At crucial, high-risk stages in the workflow, possible problems are flagged and various backup plans are outlined along with possible outcomes. 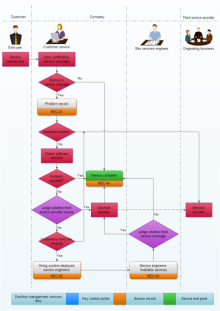 This workflow diagram allows a manager to see possible errors that will change the flow of work. Workflow diagram is an advantageous tool for even the most optimistic of managers because if an error should occur, the contingency plan is already put in place. Thus, it can help the team work more efficiently when it comes to solving the problem, as the contingency strategies are readily available. Below are the examples drawn via Edraw software, welcome to join us and share your wonderful workflow diagrams! 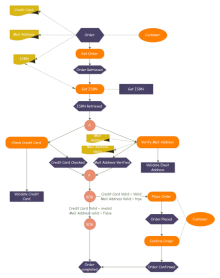 See more Workflow Diagram Examples here. Workflow diagram usually denotes movement of documents, resources, and data throughout the entire work process for a specific product or service. 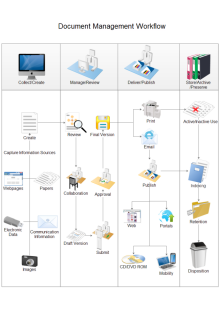 Workflow diagrams show persons responsible for every sub-process, necessary documents, resources, data and amount of time requires at each stage. Therefore, it can help people better understand the process and work more efficiently. 1. Identify the process. A process captures any repeatable set of steps. 2. Name your process. When naming your process be clear and specific. 3. Identify a clear start point and end point for the process. 4. Identify your purpose for diagramming the workflow. 5. List or draw out a series of steps that happen between the start point and the end point. 6. Look for exceptions or rules that are possible at each step in the process. 7. Don't feel obligated to use more than 2 or 3 elements. Most people do not use the vast quantity of options available in the notation because they find it only confuses their audience. A workflow diagram demonstrates all of the major steps of a process or business unit and it helps you understand the big picture and relationships between different steps and work functions, locate critical stages of the process or business unit and identify problem areas. 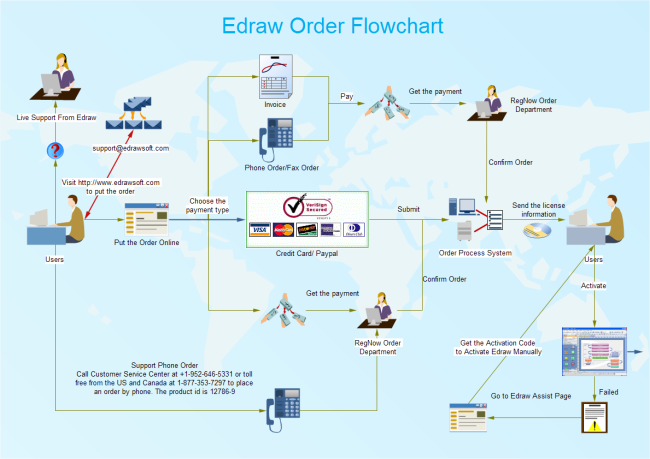 With Edraw software, special programming knowledge is not necessary to create a workflow chart, all you need to do is drag and drop the shapes you want.